Myth: Alcohol kills brain cells. Now, to qualify that title, pure alcohol will absolutely kill brain cells and many other types of cells, which is why it is used as a disinfectant. However, recent research has shown that the quantity of alcohol you could possibly take in, without killing yourself, does not introduce enough alcohol into your bloodstream to kill brain cells. This was proven by a study by Grethe Jensen and co. (1993), who meticulously counted neurons in matched samples of non-alcoholics and alcoholics. What they found was that there was no real difference in the density or overall number of neurons between the two groups. Various other research since has backed up Jensen's findings. Thus, even alcoholics who are continually taking in unhealthy amounts of alcohol aren't going to see brain cells die because of their drinking problem. However, alcohol does have other effects on the brain, both positive and negative, that have nothing to do with brain cells dying. First, the positive: drinking moderate amounts of alcohol on a regular basis has been shown to have various positive effects on your body. The one that pertains to this article's topic is that it has been shown to help protect people from cognitive impairment as they age. According to a study done at the Catholic University of the Sacred Heart, in Italy, 29% of people 65 years or older who almost never drank alcohol throughout their life had mental impairment issues. On the flip-side of that, only about 19% of people 65 years or older who drank moderate amounts of alcohol regularly had any mental impairment. It was further discovered that, among the various groups where other problems, such as health problems or the like, might impair them mentally, the same trend appeared. In every group, those who drank moderately on a regular basis throughout their lives always had a diminished chance of becoming mentally impaired in their old age compared to those who didn't drink at all or almost never drank. Now for the negative (there's a lot when it comes to intemperate alcohol consumption, so I'll only cover a few): while brain cells aren't being killed as the result of drinking excessive amounts of alcohol, the ability for your brain cells to communicate with one another is being inhibited. What's going on here is that the alcohol ends up damaging dendrites, which are the things at the ends of neurons that conduct electrochemical stimulation from another cell to the cell body in question. Basically, with some of these dendrites damaged, it inhibits the ability of your brain cells to talk to one another. 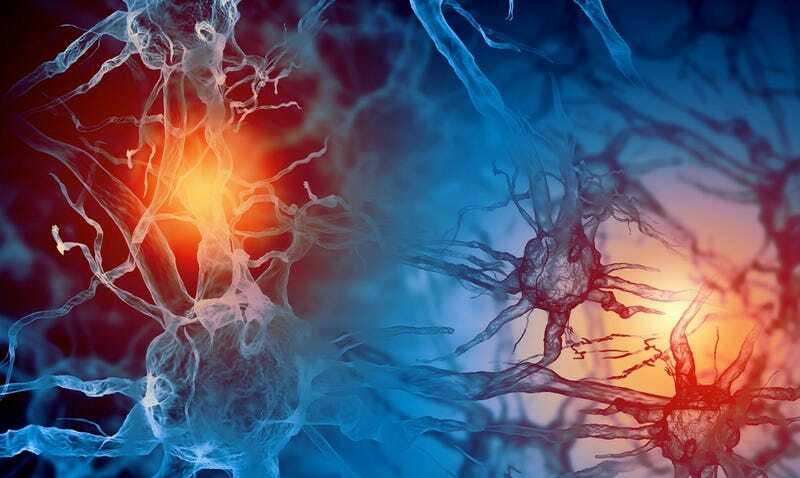 Luckily, you have an amazing number of connections and neurons in your brain (about 100 billion neurons, along with 10′s of billions of glial cells, which support the neurons). So this helps mask the problem. Also, even among long time alcoholics, it has been shown that simply quitting drinking copious amounts of alcohol is all that is required for your body to be able to reverse most of the damage to the dendrites and restore the ability for your brain cells to communicate. So you can afford to damage some of the neurons temporarily without any real lasting effect. Unfortunately, for the people who have an extreme habit of excessively drinking, there are other side effects on your brain that aren't so easily completely fixed, such as developing Wernicke-Korsakoff syndrome, which is characterized by: confusion, coordination problems, hallucinations, memory problems, eye problems, and even inducing a coma or death, if it's left untreated. What's going on here is that excessive alcohol consumption over a long period of time causes a vitamin B1 deficiency (8 out of 10 alcoholics are vitamin B1 deficient), due to the alcohol inhibiting the body's ability to absorb thiamine (also many alcoholics are often malnourished because of their own bad eating habits). This, in turn, causes neuron death, among other things. This is treatable, in most cases, but certain effects stick around forever as your body won't be able to repair itself completely from this particular brand of damage. Another brain-related side effect caused by excessive drinking is that high doses of alcohol, while not killing your brain cells, inhibits the growth of new brain cells. However, recent research has shown, at least with rats, that once the alcohol was no longer given to the rats, new brain cell production went into overdrive to try to compensate for the previously inhibited brain cell production. Now, if you go for long enough without giving your brain a chance to recover, drinking excessively on a regular basis, it is thought there may still be lasting effects due to this inhibited new brain cell growth over extended periods, but whether this is actually the case or not, isn't yet known. There are also a variety of other known neurological problems that are associated with intemperate alcohol consumptions over long periods of time and some that even show up in a short amount of time in children and teens who abuse alcohol, but this article is already too long. Then of course, there are the myriad of other problems, non-brain related that come with alcoholism, such as liver problems, other nervous system problems outside of how it affects your brain, and others. Bottom line, alcohol consumed in moderation, such as a small glass of wine a day, can be very good for you. On the other hand, drinking excessively won't kill you brain cells directly, but is still bad for your brain. Although, your body can compensate, to a certain extent, and repair the damage caused in most cases, at least as far as your brain is concerned, so long as you don't make a regular habit of it. Another myth concerning alcohol that was once spread about, particularly during Prohibition, but to which I don't think anyone actually believes anymore (at least I hope not! ), is that drinking excessive amounts of alcohol can lead to spontaneous combustion due to alcohol being flammable and it coursing through your veins. This is ridiculous on many levels, but nevertheless, was a popular notion during Prohibition and for a while afterwards. The myth that alcohol kills brain cells was also widely popularized during Prohibition. Scientists once believed that the number of nerve cells you have in your brain, once you reach adulthood, was all you'd ever have. Thus, damaging these cells could be extremely detrimental to the individual. However, this isn't correct. New neurons are created all the time in the adult brain, in a process that is called neurogenesis.